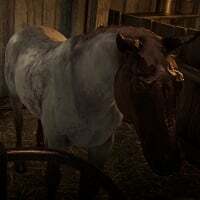 Dutch Warmblood is a Standard Horse in Red Dead Redemption 2 (RDR2). Horses are special creatures used as transport with different performance based on breed, and players can also Bond with them for enhanced features. Dutch Warmbloods are classed as hard workhorses. They can be identified by their legs and strong build. The Seal Brown, Sooty Buckskin and Chocolate Roan are purchasable in stables. A rare Cremello coat can also be discovered. This dependable breed is known to handle well. They are considered to be one of the healthiest work horse breeds, with fantastic Stamina, great Speed, and good Acceleration. Dutch Warmblood breed of horse is the largest type of work horse. Their breed is known for good health, agility and speed. You can find the Dutch Warmblood horse at ? ?